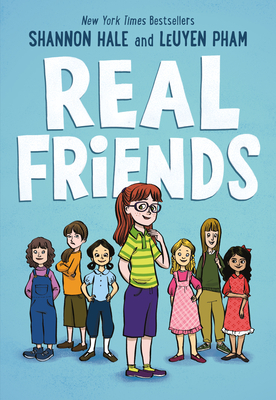 Newbery Honor author Shannon Hale and New York Times bestselling illustrator LeUyen Pham join forces in this graphic memoir about how hard it is to find your real friends—and why it's worth the journey. Shannon Hale's mother says she was a storyteller from birth, jabbering endlessly in her carriage as the two strolled through the neighborhood; once she could form complete sentences, she made up stories, bribing her younger siblings to perform them in mini plays. When she was ten, she began writing books, mostly fantasy stories where she was the heroine, and she continued writing secretly for years while pursuing acting in stage and improv comedy. After detours studying in Mexico, the U. K., and Paraguay, Shannon earned a bachelor's degree in English from the University of Utah and a Masters in Creative Writing from the University of Montana. In the interim, she submitted short stories and novels to magazines and publishers, saving all her rejection letters which she has since laminated into one continuous 60-foot roll which she proudly unfurls to audiences as a testament to her dedication and determination. Since the publication of her first book, The Goose Girl, in 2003, Shannon has become a beloved author to young readers as well as booksellers and educators. Her third novel, Princess Academy, earned her a Newbery Honor and is a New York Times, Book Sense, and Publishers Weekly bestseller. Shannon has also written books for adults, Austenland and The Actor and the Housewife. Shannon lives in Salt Lake City, Utah, with her husband, Dean, their children, and their pet, a small plastic pig. LEUYEN PHAM worked in animation before turning to children’s books. She wrote and illustrated Big Sister, Little Sister and The Bear Who Wasn't There, and is the illustrator of numerous other picture books. Ms. Pham lives in Los Angeles, California, with her husband.